The Dell XPS 14z won’t replace a MacBook Pro, but it is decent alternative for creatives on a budget. The low screen resolution and the unimpressive keyboard are a reason to look at alternatives like the HP ProBook 5330m which offers a better typing experience, though no optical drive. If you spend more time in Photoshop and movie editing tools than writing papers and emails, the Dell XPS 14z is a notebook you should seriously consider, especially with a $799 starting price. At Rs.78,900, the Dell XPS 14z is quite an expensive 14-inch notebook, but then it does justify that price, to an extent. The price jump seems to be related to the 3-year warranty that comes as standard. Also, the notebook packs an impeccable build and finish and the attention to detail is pretty darn good. More importantly, it feels like a premium product and it also has the goods to back it up. If portability and style is your criteria, then the XPS 14z is a good buy. However, just keep in mind that you’ll have to compromise on the lack of USB 3.0, a non –removable battery and the fact that you’re pretty much stuck to the two configurations that Dell have whipped up. Whether you like them or not, almost everyone agrees that Apple have been consistently creating some of the most beautiful laptop computers for many years. Dell are keen to showcase that they have the engineering prowess to compete with Apple and today we are looking at their XPS 14z, a slim laptop built around a beautiful aluminum/magnesium chassis which fits a 14 inch screen into a 13 inch chassis. Our particular review sample costs £999 inc vat. The Dell XPS 14z has one or two rough edges, but for the most part it’s very neatly designed and provides good, strong performance at a competitive price. A powerful, portable and handsome-looking system that won’t break the bank. The Dell XPS 14z offers a fantastic mix of performance, mobility and strong build quality for a reasonable cost. If it had a better keyboard and touchpad, the XPS 14z would be at least a 4-star notebook. It offers great performance and features for its size and price point, making it suitable for anyone who wants plenty of power and convenience in a unit that's also very mobile. Beautifully built and offering good usability, the all-metal, milled-aluminium XPS 14z gives you style and power in a relatively compact package, including enough grunt for light gaming. One of its standout features is that it manages to fit a 14in screen into the equivalent of a 13in chassis, but unfortunately the screen itself is distinctly average. This, combined with awkward rear-only connections and mediocre battery life, mean it’s worth considering for its strengths but not an automatic must-buy. The XPS 14z is a more compact ultraportable version of one of the best laptops of 2011. While it isn't quite as technically impressive, it's still an excellent machine that can keep you entertained and productive on the move. Among mainstream laptops, the Dell XPS 14z offers better components and better performance than most competitors, with an Intel Core i7 processor, switchable Nvidia graphics, and a spacious 750GB hard drive. Though it falters a bit on battery life, the attractive compact design and oh-so-comfortable keyboard gives other premium systems a run for their money. On the flipside, the $1,299 premium may be too steep for some customers, who might prefer the Editors' Choice Dell Inspiron 14z (Core i5), which offers solid mainstream performance without the luxury-class price tag. If the name didn't give you a clue, the Dell XPS 14z laptop is the little brother of the XPS 15z. It knocks an inch off the screen size but still offers decent performance with a sturdy metal case. The Dell XPS 14z offers decent performance for general computing tasks with a bag-friendly design and sturdy construction. If you're a gaming fan, or need a lot of ports, it won't appeal as much. Dell's XPS line of laptops has survived a few purges of the Dell rolls (Studio, Adamo, and so on) to become the company's flagship premium brand, akin to the Apple MacBook or HP Envy. The Dell XPS 14z is a nicely designed, well-built 14-inch laptop, but the XPS "z" design works better on the 15-inch version, leaving this model feeling chunky. There’s a lot to like about Dell’s 14z, including an attractive design, reasonable performance and pricing, and a better build quality than many consumer notebooks. It won’t rival the enterprise class business notebooks for build quality, but it’s quite a bit lighter than most of those and is still a healthy step up from the mostly-plastic budget laptops. Having used a couple of Dell 14" systems recently (the M14x and Inspiron 14z) we had become big fans of the form factor. Machines of this size offer the option of including performance hardware in a chassis which is noticeably more portable than the 15"+ models which are next up in the laptop market. We like the XPS 14z, but perhaps not for all of the reasons Dell is advertising. For all its embellishments, this doesn't feel like a premium laptop, and its performance doesn't put it ahead of the pack either. Finally, it's also one of the worst bloatware offenders we've seen in some time. Still, the XPS 14z is worth considering, but for a less glamorous reason than Dell intended: it's simply comfortable to use. The Dell XPS 14z is encased in aluminium and feels great to the touch. It is compact, with a 14-inch 1366 x 768 resolution display, but the casing is closer to a 13-inch notebook. We put it alongside a 13-inch MacBook Pro and found the chassis dimensions to be similar, but the screen is slightly larger naturally. It takes more than fancy tattoos and a cool haircut to be a rock star—you need to have the complete package. The thinnest 14-inch notebook ever, the XPS 14z offers up strong performance and a gorgeous design. Mobile professionals who demand a stylish, powerful PC should shortlist this one. Sehr positiv fallen die Optik und die Verarbeitung auf. Das Gehäuse, bestehend aus Aluminiumteilen, ist unempfindlich gegen Fingerabdrücke. Alle Teile sind präzise verschraubt, nichts klappert oder sitzt schief. Dank beleuchteter Tastatur kann man mit dem Rechner auch im schummrigen Licht arbeiten. Die Druckpunkte der Tasten könnten jedoch präziser sein. Positive: Good performance; Bright display; Interesting design; Not bad sound system. Negative: Significant was found. 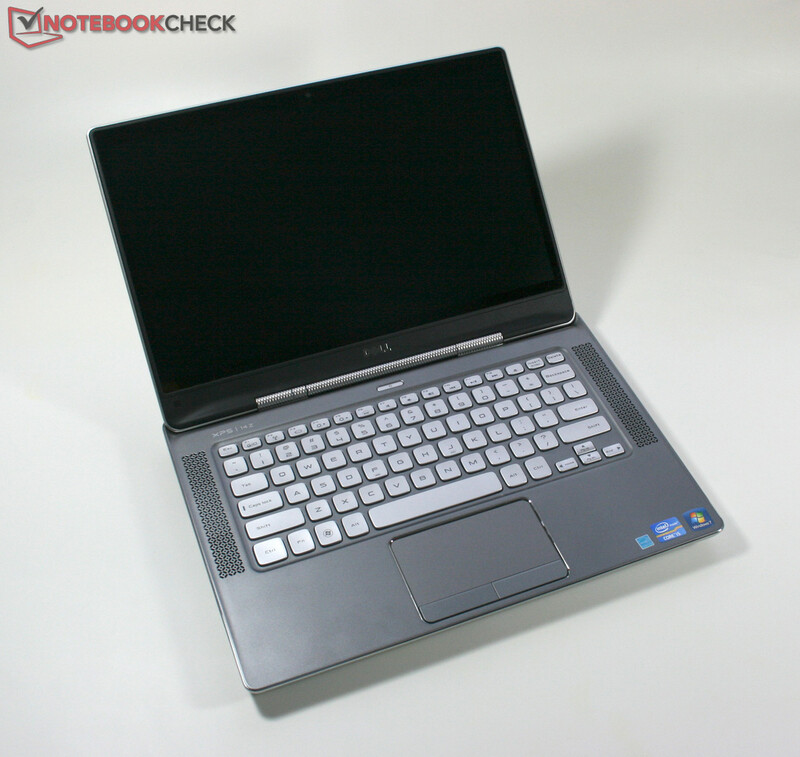 The dell XPS 14Z was released at a time in which the utrabooks were said to replace current laptops. Yet it manages to slot itself perfectly into the regular, high-end laptop category. The XPS itself is a premium category under Dell for its regular home users. Hence there is nothing less in this laptop’s specs. The XPS 14Z comes with Intel’s i5 or i7 processor and can be fitted with 8gb of RAM. It’s also quite thin for a full featured laptop and has a unique design allowing the space at the sides of the screen to be very minimal. This means that the 14 inch laptop is actually 14 inch. With a very long battery life, a backlit keyboard, a very good display and a slot in DVD drive, the Dell XPS 14Z beats many other laptops which are in the same price range both in functionality and styling. The only problem with the 14Z is the lack of available ports. It comes with one USB 2.0 and one USB 3.0 port. Also, the HDMI port has been replaced with the newer Display-Port. It is harder to connect to a external monitor via the display port unless you’re using one of Dell’s professional monitors. Otherwise, you will be forced to get a DP-HDMI converter which is quite rare. 79.23%: This rating is not convincing. The laptop is evaluated below average, this is not really a recommendation for purchase.